White dwarf stars are unusual little things. For a start, they don't shine as a result of heat and light being produced by fusion of hydrogen into helium, like main-sequence stars. No, their light emission is a result of the giving off of stored heat. This means that they appear very faint. Regarding the stuff they are made of, it consists mostly of electron-degenerate matter. Normally, when a star reaches the end of its hydrogen/helium fusion period, it expands to become a red giant and the helium that is left fuses into carbon and oxygen. If the star has insufficient mass to fuse the carbon any further, an inert core of carbon and oxygen will form. Eventually the outer layers of the star will be ejected into space, leaving behind the white dwarf star. Thus, many of these stars are composed of those two elements. There are other examples where some white dwarves manage to fuse the carbon, resulting in their being comprised of oxygen, neon and magnesium. In contrast, some never get past the helium stage. 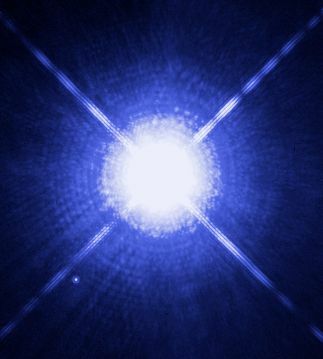 Here we see an image, taken by the Hubble Space Telescope, of the binary star system Sirius. Sirius A is the large, bright object, while the tiny dot, lower left, is its partner Sirius B, a white dwarf. This star system is only 8.6 light years away. It is thought that, within the nearest hundred star systems there are seven others. Yes, as stated already, these things are very small. A typical one would contain the mass equivalent of our Sun, yet only be a size comparable with planet Earth. The internal structure of the star is such that it can contain heat efficiently, only releasing it very slowly. As white dwarf stars are extremely hot when they are first formed, they last for epic time periods, longer than the present age of the Universe. Research has shown that the carbon/oxygen core of a white dwarf star is covered with an atmosphere of hydrogen and helium, separated into their individual pure forms by the intense gravitational field the star generates. This atmosphere acts as a sort of "cladding", which slows down the dissipation of the star's internal heat. This accounts for the star's longevity; without it, it would cool down much more quickly. A white dwarf star left to its own devices will continue to gradually lose heat and, in all likelihood, will outlast the Universe itself. The postulated theory as to what comes next is that, on losing all its heat, it will become a black dwarf. No-one will be around to see that. However, there is the possibility that a white dwarf's mass may be pushed above the Chandrasekhar Limit. This could happen if the dwarf in a binary system accreted material from its companion star, or if two white dwarves collided and merged. Under such circumstances, two things could happen. One, fusion could be initiated, resulting in a violent type I supernova, or two, the star would collapse further, forming a neutron star.